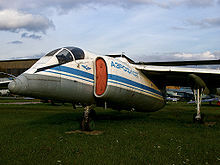 The Myasishchev M-55 (NATO reporting name: Mystic) is a high altitude reconnaissance aircraft developed by the Soviet Union's Myasishchev design bureau. It is similar in both its mission and design to the American Lockheed U-2 spy plane. It is a development of the M-17. Differences include two turbofan engines instead of one and greater maximum take-off weight. The M-55 was first known as the M-17. Its life began in 1978 when Soviet engineers searched for ways to intercept American unmanned reconnaissance balloons. The first flight of the M-17 was 26 May 1982; this aircraft was soon detected by U.S. observers. With the introduction of another model of this class, this interceptor M-17 would later become known as the M-17 Mystic-A. On March 28 1990, M-17 '17401' piloted by Vladimir Arkhipenko set an altitude record of 21,830 m (71,621 feet). This remains a record in the 16 to 20 tonne landplane class. The M-17 set a total of 12 FAI World Records, 5 of which still stand today. The M-17 balloon-interceptor model was terminated in 1987 and replaced by the M-17RN, also known as the M-55 Geophysica, which was dubbed by NATO Mystic-B. The first one of these flew in 1988, but as the Soviet Union collapsed, military demand dropped. In 1994, the reconnaissance version was terminated after only five aircraft were built. On September 21, 1993, an M-55 piloted by Victor Vasenkov from Akhtubinsk airfield reached a class record altitude of 21,360 m (70,078 feet). (The M-55 being in a heavier class than the M-17) The M-55 set a total of 15 FAI World Records, all of which still stand today. A number of M-55 Geophysica remain in service, performing in research roles. One M-55 took part in a study of the Arctic stratosphere in 1996-1997. An Irish headquartered company, Qucomhaps, with a focus on South East Asia, have entered a USD1 Billion deal to use M55 as High Altitude Platform Stations for digital communications. 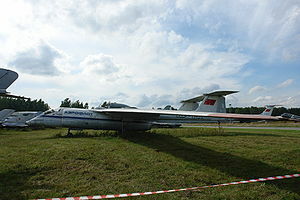 Myasishchev M-55 Pictures and Myasishchev M-55 for Sale.